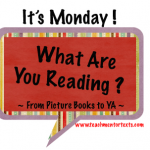 I'ts Monday, What are you Reading? The Flying Beaver Brothers and The Fishy Business by Maxwell Eaton 111. A graphic novel for approximately 8 to 11 year olds. I enjoyed it and think some of the students will too. Babymouse and Puppy Love another graphic novel by Jennifer and Matthew Holm. I know the Babymouse fans and animal lovers in the class will like this one. Marty Mcguire by Kate Messner and Brian Floca. I really enjoyed this one and will be looking forward to reading about her digging worms! This book will be enjoyed by the younger readers in my class and I intend matching them up with Marty. As I am learning to work with iMovie on my iPad I made a little book trailer for Marty Mcguire, nothing special but gave me the sense of how iMovie on my iPad can work for students making book trailers. Once I mastered the ability to put the music I wanted onto my iPad I was happy! Sometimes small things take a bit of time. 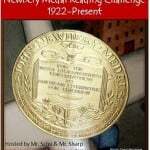 Archive of this months #titletalk. Not being in class these times I was able to attend this month, it was fantastic but so fast, I need to go back and glean all the pearls. Today I have been following some of Kevin's work on Digital Storytelling here and as I read I found out an answer to a question I had yesterday about screencasting and one of his videos. It is made using Google Search story. He encouraged his learner to make a story about teaching which I am about to do soon. But just while I was exploring it I tried one about my country. And here is my teacher google search. I think this would be fun for students to do. For example it would be a great beginning of the year activity for them to introduce themselves. I am sure we could come up with many ideas when we put our minds to it together. If you have made your own would love if you left a link. If you haven't I challenge you, do one right now. It will take very little time. I think I Prefer Screenr. Yesterday in the post below I made a screeencast that took me a long time to figure out and at the end I was not that happy with the quality. I also had to download the software, and that can be a nuisance when you are dealing with computers and a server. So today I thought I would try Screenr. This is an online service so nothing needs to be downloaded, and I can embed it in a blog. So I tried it out and I was much happier. The sound is reasonably good, despite a little hiss, and the picture is significantly clearer. I can definitely see this little piece of software being very user friendly for my class. They often teach each other about blogging, so this could inspire them to make a series of tutorials that we could have as a bank for new students. They could then follow them in their own time. They do need to log in, but this can be done easily with your google email, which the students have. The other requirement is Java, and I know we have that installed, I am not sure if its updated but that is easily seen to - I think! Here is a very brief video to my students using the reply button for threaded comments, which we are not doing! Myself included. Well actually it began a little inauspiciously with a trip to the Doctor for antibiotics. Can you believe it, first day in and I get sick! Typical teacher story I guess! So five weeks to explore and learn about what interests me. However today I have started to feel the excitement of taking time to think about, learn about and increase my skills in the area of digital storytelling mainly. I have just been searching on my computer for my application form for the sabbatical. Can't find it. Luckily I made a blog post about it here, so I have my map! As I read through it my first thoughts are - "Way too much!" However one step leads to another and I think while I will keep the map and questions in mind, I will go where my interest at the time takes me. I sense I will focus on digital storytelling and only include the rest if I have time. Over the last year I have been saving web pages that I have come across into Diigo, so I have plenty to start with. You know, all those interesting pieces of information you just don't have time to explore as you are caught up in the nitty gritty of everyday school life. People have asked me are you going to travel, visit other schools? Well I don't plan too, but who knows. The beauty of the web is I can visit the USA, or Auckland or Christchurch or wherever, and never leave my study room. I can attend a online seminar or if I can't attend the seminar led by a teacher who's work I admire, I can view his Prezi and interact with him on his blog. So I have started exploring Kevin's Meandering Mind blog, he is an active teacher, learner and person who shares his learning story so that others may learn too. I quickly peruse his post when he writes, but now I have the time to really dig deeper into it. 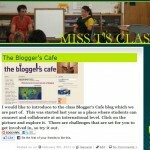 Finally I settled on Active Presenter and here is a little screencast I made exploring this software. I haven't got a full handle on it yet. I suggest you watch it in full screen as it is not clear when in the smaller size. I read just the one book this week - Super Finn by Leonie Agnew. It was a quick read once I got going, and I even surprised a few laugh out loud moments out of myself. This book would mainly suit about Year 6, although one of my Year 8 students awarded it 4 out of 5 stars. Leonie Agnew is a teacher and I think there was some gentle ribbing going on regarding how PC our schools can sometimes be. Marty Maguire by Kate Messner - been meaning to read this for awhile. The Flying Beaver Brother and the Fishy Business by Maxwell Eaton. I fell off the wagon there for a couple of weeks towards the end of term and first week of the holidays. I kept reading but just didn't find the energy to blog. Up and running again now! During that time I finished the Hunger Games trilogy, I had to stand in line with some of the readers in my class who were also madly passing them from hand to hand. I was surprised at how much I enjoyed them, even though the whole concept was so repugnant to me. I am going to count Okay for Now by Gary Schmidt into this week as well. I did read it over the NZ summer break, and have spent our 1st term reading it aloud to my students. They all fell in love with it too! We finished on the final day of school, as I closed the book there was a spontaneous round of applause. Now I know its not my reading, it was the book. I so love this book, I loved reading it again - the voice of Doug comes through so strongly. His intimate way of addressing the reader had some of my students spontaneously answering him as I read. As we read along I placed a picture of the bird that the chapter referred to and I found that a tremendous help. 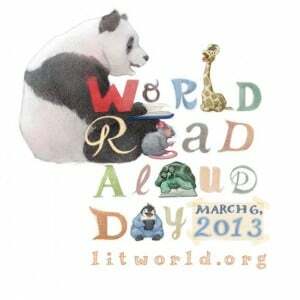 Fabulous read aloud book. My students are very keen to read more books by this author so I must check out The Wednesday Wars. 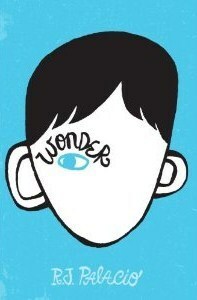 I have just finished this book Wonder and it was amazing. I know everyone that has read it will say that. 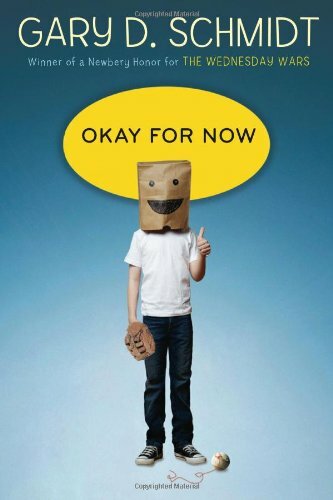 This is a book that I want to read aloud to my class. I won't be there this term and I can't decide whether to drop it into the class library now, or hold it over to when I return in Term 3. It can be bought in NZ book shops which is a plus. Reading this book was a spiritual experience, one that touches the human heart in a way that you know you can never be the same after reading it. If you are looking for a book with a theme of kindness this is it. and this one on Read, Write, Reflect. 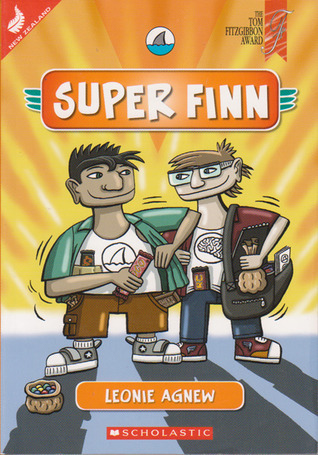 This coming week I am going to be reading Super Finn by Leonie Agnew, a book contender for the NZ Post Book awards. Maybe something else as well, I will see where the mood takes me.